Your iPhone is not getting an update and seeing Unable to verify Update iOS 12 on iPhone. Sometimes during the process of updating the iOS system, it may hang up on any one screen, and it usually does up on the page of verifying update. It may be harassing because of this slow process and hanging the system. For getting rid of this, you may follow these easy steps and solve your problem. First of all, you can lock and unlock your iDevice through power key and also may need to do this 5-10 times. Maybe Apple server down for some edge location, check apple service is up in your area. And Go with next step if you find everything is up and beautiful. System Status is here. Soft Restart: Press and Hold Sleep/Wake + Home button until you see a slide to turn off option on the screen. iPhone XS/ XS Max/ XR/iPhone 8/iPhone 8 Plus: Quickly Press and Release Volume up and Down button one by one, Press and Hold Side button until you see the apple logo on the screen. iPhone 6S and Earlier: Press & Hold Sleep/Wake + Home button until you see the apple logo on the screen. iPhone 7/iPhone 7 Plus: Sleep/Wake + Volume down button, until you see the apple logo on the screen. Once your iPhone has rebooted, go settings tap to general and about and make sure that you have updated the iOS if not repeat the process. Connect your iPhone via lightning cable on Mac/PC, Open iTunes on Mac or PC. Tap on Summary > Next Tap on Update. (your iPhone Will upgrade without lost data). Otherwise, Restore Button: Take Backup from iTunes, Erase all content and install new iOS then restore the backup. This solution Apple is recommending bypassing all error and bug fix. This problem may be arising due to a discontinuous supply of the internet connection. Make sure that doing the update of your iPhone version the internet connectivity is stable and robust. This will not interrupt the complete process. Your iPhone has serious WiFi issues get more tips (Showing in Status Bar but not working): WiFi not working on iPhone. Offering the reboot to your iPhone device that will help you to solve the issue of the screen hanging out and give a smooth start to iPhone device. Sometimes giving a pure shut down will help you out and giving your network a fresh restart to your iPhone. If all this didn’t work then remove your iOS and again download it by the same process will help to solve your all problems regarding this, and you are back on your normal mode. Like it! Share it! 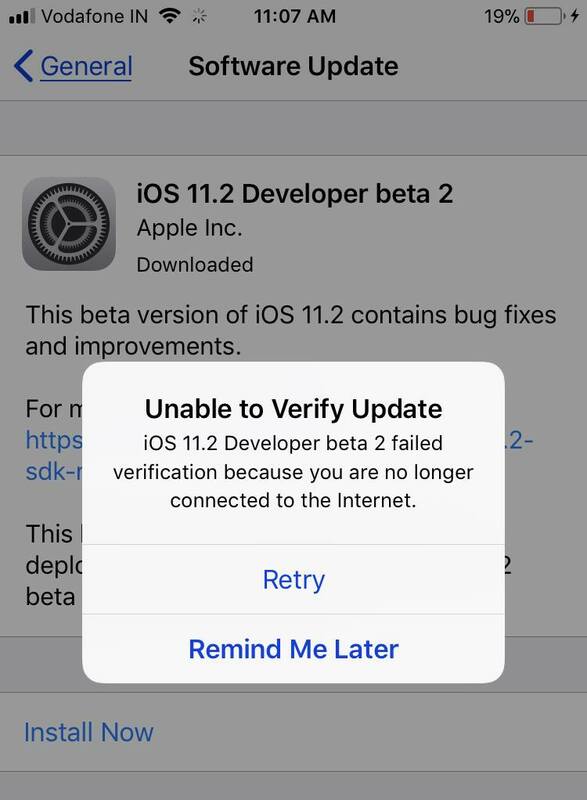 Unable to Verify Update iOS 12 on iPhone or iPad.